To eat a sauteed duck breast and with a red wine-fruit sauce is sublime. The meat is best served medium rare like a steak. The absolute best duck breasts come from Sonoma Foie Gras and are so large each one serves two. Lesser quality ones would benefit from marinating a day ahead in red wine with salt and pepper. Bon Appetit! If the duck breasts come in a package, separate them, rinse and dry them, and sprinkle them generously with salt and pepper. 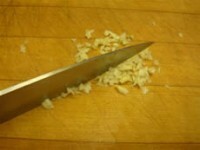 With a sharp knife score the skin two or three times in two directions. To cook them, lay them skin side down in a heavy sauté pan and begin to heat slowly. 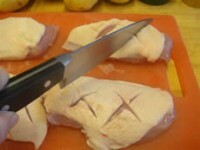 The best is to render a lot of the fat out of the duck breasts before turning with tongs to brown the other side. As the duck breasts cook, pour the fat into a pyrex measuring cup. Turn with tongs to brown on both sides. You can tell when they are cooked when they begin to shrink, about 8 minutes. 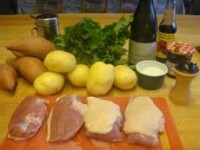 Transfer the duck breasts to a plate and keep warm while you make the sauce. 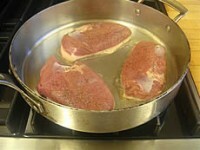 As soon as all of the duck breasts are cooked, without hesitation pour off all the fat. 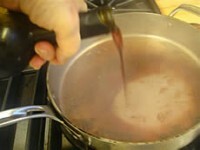 Immediately, pour in the red wine to deglaze the duck juices on the bottom of the pan and boil up to cook off the alcohol. Stir in the chicken stock and continue cooking. After a few minutes, stir in the pomegranate molasses and enough fruit preserves to make a nice sauce. Taste, and season with salt and pepper. 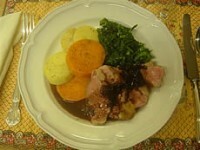 To serve, slice the duck breasts as shown into long slices, and serve with the potatoes and broccoli rabe; spoon over the sauce. Peel and slice both kinds of potatoes into 1/4-inch slices. Layer the potatoes with salt and pepper and dots of butter. 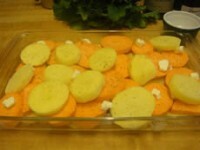 Cover with foil, and bake in a 400 degree oven until the potatoes are tender when pierced with a fork, about 40 minutes. (Can be made ahead and reheated). Bring a large pot of water to the boil. Cut the broccoli rabe into 1/2-inch pieces starting with the leave end and using the stem ends as a handle. Discard most of the tough stems. 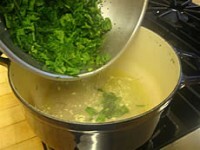 Drop the cut broccoli rabe into rapidly boiling salted water and cook until tender, about 6 minutes. Drain. Into the same pot put the garlic with the olive oil and a sprinkling of salt. Return the broccoli rabe to the pan and coat with the garlic mixture. (Can be made ahead and reheated). Copyright © Mary S. Risley.